The research published today in Proceedings of the National Academy of Sciences (12 November 2018) and carried out by a team of experts from international conservation charity ZSL (Zoological Society of London), London's Natural History Museum (NHM), and the American Museum of Natural History in New York, also reveals that monkeys must have colonised the Caribbean islands more than once. The study reports an incredible discovery of how the unusual ecology of islands can dramatically influence animal evolution. Xenothrix, unlike any other monkey in the world, was a slow-moving tree-dweller with relatively few teeth, and leg bones somewhat like a rodent's. Its unusual appearance has made it difficult for scientists to work out what it was related to and how it evolved. However, the scientific team have successfully extracted the first ever ancient DNA from an extinct Caribbean primate -- uncovered from bones excavated in a Jamaican cave and providing important new evolutionary insights. Professor Samuel Turvey from ZSL, a co-author on the paper, said: "This new understanding of the evolutionary history of Xenothrix shows that evolution can take unexpected paths when animals colonise islands and are exposed to new environments. However, the extinction of Xenothrix, which evolved on an island without any native mammal predators, highlights the great vulnerability of unique island biodiversity in the face of human impacts." Professor Ian Barnes, whom runs the NHM's ancient DNA lab, and co-author said: "Recovering DNA from the bones of extinct animals has become increasingly commonplace in the last few years. However, it's still difficult with tropical specimens, where the temperature and humidity destroy DNA very quickly. I'm delighted that we've been able to extract DNA from these samples and resolve the complex history of the primates of the Caribbean." It is likely that Xenothrix's ancestors colonised Jamaica from South America around 11 million years ago, probably after being stranded on natural rafts of vegetation that were washed out of the mouths of large South American rivers. Many other animals, such as large rodents called hutias (Capromyidae) that still survive on some Caribbean islands today, probably colonised the region in the same way. 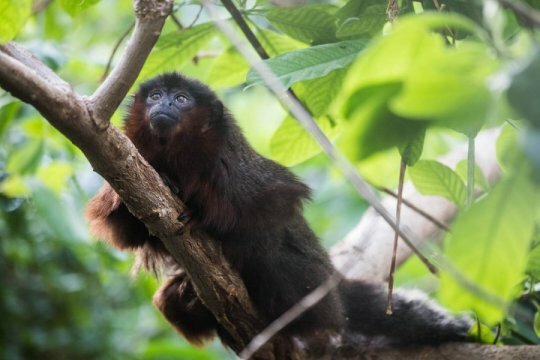 Ross MacPhee of the American Museum of Natural History's Mammalogy Department, a co-author of the study, said: "Ancient DNA indicates that the Jamaican monkey is really just a titi monkey with some unusual morphological features, not a wholly distinct branch of New World monkey. Evolution can act in unexpected ways in island environments, producing miniature elephants, gigantic birds, and sloth-like primates. Such examples put a very different spin on the old cliché that 'anatomy is destiny.'" What Xenothrix may have looked like has been greatly debated, with suggestions that it looked like a kinkajou (Potos) or a night monkey (Aotus). Living titi monkeys are small tree-dwelling monkeys found across tropical South America, with long soft red, brown, grey or black fur. They are active during the day, extremely territorial and vocal, and live up to 12 years in the wild, with the father often caring for the young.